Folks might recognize Don Hagist’s name from the British Soldiers, American Revolution blog. 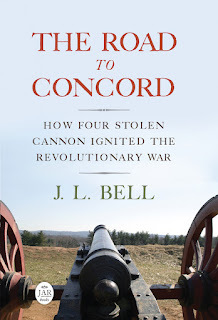 He digs out details about the enlisted men who were part of the British government’s effort to hold onto those thirteen rebellious North American colonies. His research can turn some faceless redcoats into individual people. Often that task involves paging through muster rolls, pension grants, court-martial records, and other British military documents now stored at the National Archives at Kew. Unfortunately, there’s no British equivalent to the American pension application system, which (in lieu of systematic record-keeping during the war) required veterans to provide detailed narratives of their service. That means most British soldiers are preserved as names on a few documents without a line connecting those dots. A few redcoats left detailed personal narratives. One of Don’s earlier books was an edition of Sgt. Roger Lamb’s postwar writing that collected all his first-hand military experiences in one volume. Don’s new book, British Soldiers, American War: Voices of the American Revolution, reprints nine shorter narratives of service in the king’s army (as well as the samples of the work of two military poets, including John Hawthorn). The narratives include the information taken down by the pension office, a letter written during the war to a potential patron, a convict’s dying words, and several published memoirs. In each case, Don has checked and filled out the soldier’s own account with contemporaneous documentation, where available. Thus, the book includes the autobiographical “Dying Speech” of Pvt. Valentine Duckett, executed for desertion on Boston Common in 1774, and the record of his court-martial. Another court-martial fills out the story of Pvt. Thomas Watson, who survived to settle in Bolton, Massachusetts. You’ve probably spotted a significant pattern in these narratives: most of the memoirists ended up becoming American. Of the nine men profiled in the book, only two retired from the British army in good standing. Six deserted to the Americans or, in the case of Ebenezer Fox of Roxbury, deserted back to the Americans. Their recollections got published because in America those men became honored relics of our War for Independence. British society simply wasn’t that eager to read the experiences of enlisted men. That may have been due to how societies don’t like to be reminded of wars they lose. But I think it reflects the aristocratic values of Georgian Britain. We see the pattern already right after the Battle of Lexington and Concord. The Massachusetts authorities published broadsides naming all the local men killed and wounded, regardless of rank. Gen. Thomas Gage sent home reports listing the officers killed but not the enlisted men. (Granted, that would have been a much longer list.) American culture valued ordinary individuals more. Given the social stratification in Britain, it’s no surprise that several of these redcoats saw more opportunity on the other side of the conflict. One chapter of British Soldiers, American War documents how the army encouraged soldiers to learn to read and write, valuable skills in any large organization. But even an educated enlisted man was very unlikely to rise above sergeant. As memoirists and as defectors, most of the men who left behind recollections for British Soldiers, American War were atypical. But of course all memoirists are atypical (at least until this era of self-publishing). And these men offer a rare peek into the daily lives of British recruits. Alongside Don’s research on recruitment patterns, demographic data, &c., the book is a top-notch source on the king’s soldiers during the Revolutionary War, “ordinary” men caught up in historical change. British Soldiers, American War is handsomely designed (though, reflecting what Georgian artists were commissioned to paint, the cover art shows British officers instead of enlisted men). The profiles include images of some of their documentary sources. Eric H. Schnitzer’s drawings and detailed captions discuss the soldiers’ likely garments, which should increase the value of the book for reenactors. Thorough notes and index round out a fine volume. As it happens, I recently read a Mental Floss article on this exact question. Unfortunately, after reading that article I am no wiser than before.